The Volkswagen Beetle is without question one of the world’s most historically significant cars. Let’s see if the price on today’s Nice Price or Crack Pipe Bug means that it’s history. What kind of mobile mansion person are you—camper or trailer? Each type has its pros and cons, but either way you go, when you’re not getting your vay-cay on you’re stuck with either driving, or worse parking, your vehicle of choice. That might not be so bad when that choice turns out to be yesterday’s 1995 Ford F350 Centurion diesel dually, that’s at least according to the 54-percent of you who awarded its $5,500 price a Nice Price win. Let’s get one thing straight: by modern standards, the VW Type 1 is a terrible car. But then, so too are the Citroën 2CV, original Fiat 500 and Sir Alec Issigonis’ Austin 850. Relatively crude in operation, unsafe in an accident, and lacking in any place for a satisfying Big Gulp other than your clenched thighs, they all leave a lot to be desired. But who wouldn’t give a valued extremity for any one of those today? Prices on classic Cits, Minis and Fiats in decent shape are nowadays well into the teens, while early editions of the Beetle (the damn thing was in production for over 50 years) can command nose bleed values. This 1970 Volkswagen Type 1 doesn’t require such nasal phlebotomy, but we’ll still need to see if it’s worth its current asking. 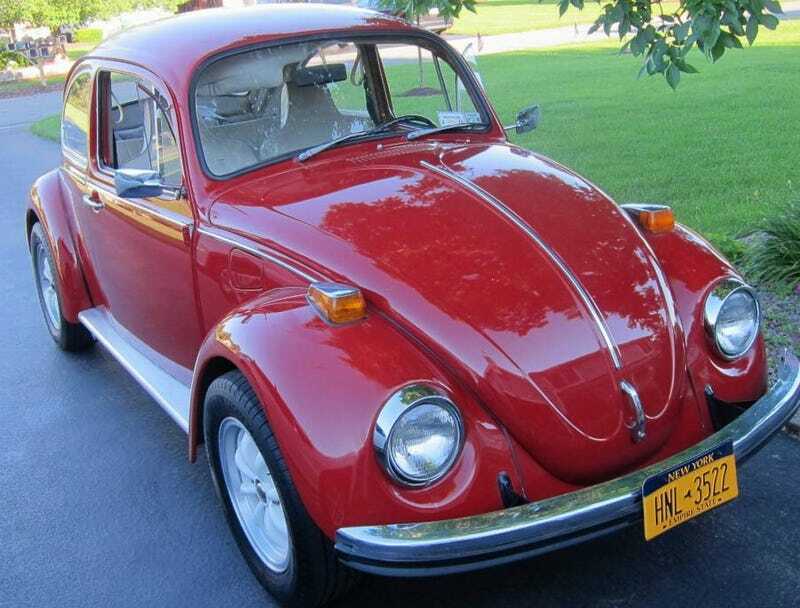 The seller of this red on white Bug claims it to benefit from an older—and seemingly incomplete—restoration. The work done included stripping the car to its platform, the rebuilding of its 57-bhp 1,600-cc engine, and the upgrade to disc brakes at all four corners. All noble efforts. The electrical has also been updated with an alternator so your headlights might now be white rather than yellow. The bodywork appears to be in pretty nice shape, with the ad noting only a few rock chips in the nose. The glass and rubber seems to be good all the way around, as does the welting. The interior is unfinished, and some of the choices made there might need to be rethought as well. The carpet is missing from the kick-panels and I’m not sure what’s going on with the lights and switches on the dash, which seem to be danglers in some instances. Perhaps the most egregious issue in here is the burlap that has replaced the standard vinyl headliner. Don’t these people know that the only thing burlap is good for is the sacking of potatoes and the clothing of impoverished waifs? On the plus side, it all at least looks tidy, and the seller claims the car to be up to daily driver duty. Adding that claim, the exhaust heat capture tubes are in place, there’s some aluminum running boards on the sides, and the car rides on a nice set of period-correct EMPI alloys wrapped in Michelin Pilot tires. It comes with only 67K on the odo and brings along a clean NY title. It used to be that the Beetle was the ultimate first car. It was cheap, easy to wrench-on (that’s where most of us learned how to adjust valves, I don’t doubt), and they would run all day on a thimble-full of gas. Those days are long over, and Beetles aren’t as ubiquitous on the road as they once were. This one seems to need little and presents as a nice survivor. Could you however, survive paying $7,500 for it? The base price for this Beetle when new was $1,874. That’s about $11,820 in today’s dollars so really, you’d be getting a deal at that $7,500, right? Well, that’s just what we’re about to find out. What do you say, is this Beetle worth that $7,500 asking? Or, does that price squash this Bug? For $5,500, Could This 1995 Ford F350 Crewcab Dually Really Make America Great Again?